Looking for a trusted commercial paving contractor in Bergen County NJ? Call (201) 327-5258 today for Ramsey commercial asphalt and parking lot construction. We will schedule an appointment for a contractor to visit your commercial property and get the process started with a free estimate. Take advantage of our online coupons when you click here. Making the right choice for commercial paving in Bergen County NJ is something to take seriously. The state of your commercial parking lot says a lot about your company or organization, and its commitment to create a positive experience for everyone that uses the lot. A broken down and faded parking lot with no visible lines or symbols creates a perception that you don’t care, which can cause serious problems depending on the nature of your business. Read online reviews of our services from people just like you when you click here! 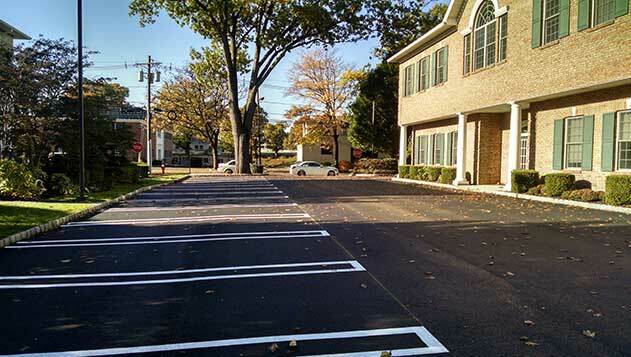 When you’re ready for a parking lot or a new driveway in Bergen County NJ for your commercial space, the experts at McFarlane Asphalt are standing by. When you hire a reputable contractor like McFarlane that has a great deal of experience working with local residents and businesses, you can be sure you’re getting the quality you deserve. Hiring a local contractor means you can see other projects they’ve completed to get a feel for how the work holds up over time. There are many aspects to consider when constructing a parking lot. You need someone that can handle every element from start to finish. This is why we’ve become the top choice of so many local business owners in need of commercial paving. Most parking lots consist of three separate layers. These include the sub-grade, crushed stone and the asphalt. The sub-grade layer of the parking lot is the actual soil that’s underneath the finished lot. There are different types of soil that may be down there, and it is important to achieve the right density before proceeding to the next step. The crushed stone is brought to the site on trucks, then is spread with a grader and compacted with rollers. The stone also has to reach the right density, so it is watered and re-compacted until that happens. Sometimes, this step takes a few days, as the moisture has to leave the rocks. Lastly, the asphalt is applied hot, ideally during a warm day. The lot must be leveled correctly to achieve the right amount of drainage, and in many cases, lines have to be painted on for parking spots. At McFarlane Asphalt we have a great deal of experience when it comes to parking lot and driveway paving in Bergen County NJ. The design and construction of your parking lot is dependent on a handful of different factors. The crushed stone and asphalt layers may vary in thickness and density depending on factors such as the amount of traffic that’s anticipated, the strength of the underlying ground and how long the owner expects to use the parking lot. When you need commercial paving in Bergen County NJ, make sure you go with someone who is experienced and professional. Call McFarlane Asphalt at (201) 327-5258 in Ramsey, NJ and the surrounding for fast, reliable service and a parking lot that will stand the test of time.